PLEASE READ ENTIRE PAGE BEFORE APPLYING!!! Complete the required 8-hour course to obtain your Certificate of Competency or have military equivalent. Not be under any disability to possess a firearm. This includes federal disqualifications that the Sheriff may consider. Do NOT bring a firearm with you when applying for or picking up your license! Be a resident of this county or adjoining county. Make an online appointment with this office. Fill out an Ohio CCW Application completely including signature. Have a color photo, passport size 2″x2″, taken within 30 days (many photo shops, drug stores, groceries, and similar businesses that handle photo development may be able to help you obtain this size photograph). Have a valid identification, driver’s license, state I.D., or passport. Pass a criminal background check and mental competency check. Have an original Certificate of Competency or Prior Equivalent Documentation (We do not Keep the Certificate). Already have a CCW License issued by another Ohio county or another state with a reciprocity agreement. If you are Active Duty Military with a current ID Card, a Veteran, or Retired Military, your fee will be waived. Bring in a DD214 stating you were honorably discharged. NOTE: Persons considering carrying concealed handguns in these states should contact that specific state for additional information on their laws pertaining to the transportation and carrying of concealed handguns. Monday: 5:00 A.M. to 7:00 A.M.
Tuesday: 5:00 A.M. to 7:00 A.M. & 4:30 P.M. to 6:30 P.M.
Wednesday: 4:30 P.M. to 6:30 P.M.
Thursday: 5:00 A.M. to 7:00 A.M. & 4:30 P.M. to 6:30 P.M.
Friday: 4:30 P.M. to 6:30 P.M.
Saturday: 09:00 A.M. to 11:00 A.M. Applications and CCW booklets may be picked up at the Dispatch Service Window Monday through Friday, 8:00am to 4:00pm or they may be obtained through the Ohio Attorney General’s website, www.ohioattorneygeneral.gov. 2. If from Sheriff’s Office records applicant must present certified copies of source of information, i.e. court record, Prosecutor’s Office records, if the case was dropped, found not guilty, etc. If denied, may reapply in one year, if not permanently disqualified by conviction. NOTE: Expunged/Sealed Records may NO LONGER be used to deny an applicant. 7. Is CURRENTLY SUBJECT to a Civil Protection Order, or a Temporary Protection Order in this or any other state. 9. Was DISCHARGED from the Armed Forces under DISHONORABLE conditions. Sealed records, also known as Expunged records are NO LONGER able to be examined and used for the purposes of the background investigation for concealed carry license applicants. This is the fee schedule for a standard concealed carry license. ** ONLY CASH, CASHIER’S CHECK OR MONEY ORDERS FOR THE EXACT AMOUNT WILL BE ACCEPTED. 20. Any place prohibited by Federal Law. 21. Any premises, property or motor vehicle of a private employer, where rules/policies have been established and signs posted. There is a 30 day grace period after expiration during which you may continue to carry. Licensee may come to the Sheriff’s office to contest within 14 days of notice mailing. If upheld Sheriff shall revoke and licensee must surrender immediately. 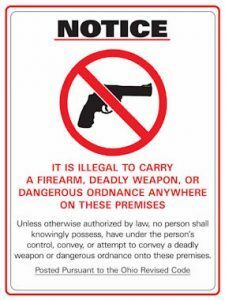 Pursuant to ORC 2923.1212 signs shall be posted in conspicuous places, prohibiting persons from carrying a firearm into prohibited places. In order for a law enforcement officer to enforce an employer’s rule, policy, practice, a sign must be posted in a conspicuous place. Below is a sample of the sign which may be posted warning persons NOT to enter the premises where the sign appears while carrying a firearm. THIS sign cannot be used by schools or at courthouses. THIS sign must be posted in a conspicuous place per ORC 2923.126(C)(1). Suspension to begin on date licensee arrested or Temporary Protection Order or Civil Protection Order issued. Suspension ends if charges dismissed, or Temporary Protection Order or Civil Protection Order canceled. Licensee shall be notified by letter sent certified mail. Licensee must surrender license to Sheriff within 10 days of notice. License will be returns when suspension ends. NOTE: Temporary Emergency License is valid for 90 days from date of issue and may not be renewed. A Temporary Emergency License can only be issued one time within a 4 year period. Although the law states that the Sheriff shall “immediately” issue a temporary concealed license, the law also states that the applicant must pass the background check, including the WebCheck fingerprints. This does not mean the license will be issued the same day it is applied for, however the Sheriff shall “immediately” begin the background check process, and “immediately” upon receipt of the results of the records check the Sheriff shall review the information and determine whether the criteria is met. If the criteria is met the applicant will be contacted to process the license. If the criteria is not met the Sheriff shall specify the grounds for the denial in a written notice to the applicant. 2. New applicants must have received a Certificate of Competency as specified in ORC Section 2923.125(B)(3)(a), (b),(c),(e), or (f), within 3 years prior to the date of application, covering the training requirements as specified in ORC Section 2923.125(G)(1) and (G)(2). 3. Applicant is not disqualified pursuant to criminal background check or mental incompetency check, as specified in ORC 2923.125(D)(1)(d), (e), (f), (g), (h), (i), or (j), or retired as a result of a mental disability. 4. Must have a 2′ X 2′ color Passport style photo taken within 30 days of the application. 5. Attest that applicant has read pamphlet provided by the Attorney General’s Office as specified, and also attest the handgun shall be carried for a lawful purpose. Must produce an original or photocopy of a certificate of completion of a firearms training program, dated within 3 years prior to application, signed by the instructor, certifies that the training complies with the requirements set forth in division 2925.125(G), and the course was open to members of the general public and utilized qualified instructors who were certified by a national gun advocacy organization, the executive director of the Ohio Peace Officer Training Commission or a government official or entity of another state.